Successfully Added Android 4K TV Box "Spectra Plus" - 4K UHD Resolutions, Quad Core CPU, 2GB RAM, Kodi, Airplay, Miracast, Android 5.1 to your Shopping Cart. Want to watch all your ultra-high-definition content on a capable but affordable Android TV box? The Spectra Plus is just what you're looking for – now working with Android Lollipop 5.1! 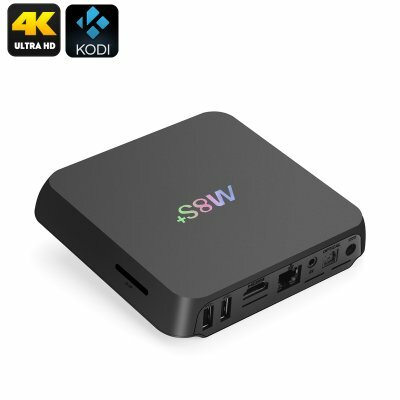 The Spectra Plus is an Android TV box designed to work specifically with 4k content – making it an ideal accessory to wide-screen televisions capable of outputting ultra-high-definition video. The box is powered by a capable Amlogic S812 quad core CPU and a beefy octa core Mali-450MP GPU. These processors are further supported by 2 gigabytes of RAM, and comes with 8 gigabytes of internal storage and support for up to 32 gigabytes of external storage. Or you could just plug in an external memory pen or other storage option in one of the USB ports to play all the stored videos you want! All this powered by Google's Android 5.1 operating system – aka Lollipop. Guest modes for visitors, chromecast support, support for OK Google, lock screen notifications – these and many other quality-of-life changes make Android 5.1 a much better and smoother interface to work with. The main strength of the Spectra Plus, however, is its ability to work with a variety of wired and wireless devices. An HDMI port, two USB ports, an SPDIF port, SD card slot that support up to 32 GB cards, an AV, an RJ45 port, and a DC jack all let you work with a variety of wired devices. Then there's support for Miracast and Apple AirPlay. These two technologies let the Spectra Plus wirelessly connect to your phone, tablet, or personal computer without having to hook up any cables at all. Very nifty for cutting down on spaghetti wires as you work with the TV box! The Spectra Plus also comes pre-installed with Kodi – a very capable media center that lets you play all sorts of content. This ranges from music and movies so you can stream all the latest content that straight from the Internet. You can even connect to live TV feeds such as MediaPortal and VDR – not to mention add-ons that let you modify the behavior and look of the media app itself. The Spectra Plus Android TV box comes with a 12-month warranty, brought to you by the leader in electronic devices as well as wholesale Android TV boxes..